The number of corners of the Tt triangles in N Trees/N-tree with T nth-order triangles ≡ C = C + Tc. The number of sides of the Tt triangles in N Trees/N-tree ≡ S = S + Ts. 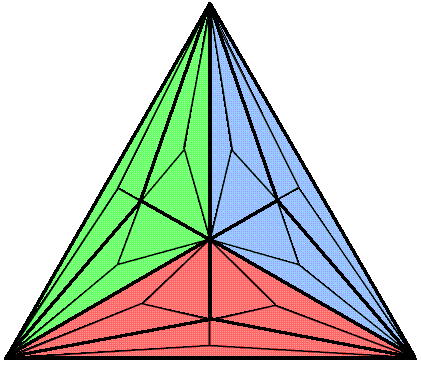 The number of 0th-order triangles in N Trees/N-tree ≡ T = Tt. The number of geometrical elements in N Trees/N-tree ≡ G = C + S + T = C + S + T(c+s+t) = C + S + Tg. The number of hexagonal yods inside each of the T nth-order triangles = 2s + t.
The number of hexagonal yods lining the outer sides of these nth-order triangles = 2S. The number of hexagonal yods in N Trees/N-tree ≡ H = 2S + T(2s+t). The number of yods in N Trees/N-tree ≡ Y = C + 2S + T(2s+t). Table 6. Yod population of N-trees/N-tree with nth-order triangles. Table 7. Yod populations of N Trees/N-tree for n = 0, 1, 2 & 3. Table 8. Geometrical & yod compositions of the nth-order N-gon. ("1" denotes the centre of the nth-order N-gon). Table 9. Geometrical & yod compositions of the 7 enfolded nth-order polygons and the (7+7) enfolded nth-order polygons. Notice that the number 101 is the 26th prime number and that the number 47, which is the number of sectors of the seven enfolded polygons, is the 15th prime number. The number 26 of YAHWEH, the complete Godname of Chokmah, and the number 15 of YAH, the shorter form of this Divine Name, arithmetically determine the yod population of the inner Tree of Life, whatever the order of its 14 polygons. Notice also that the number 67 of Binah appears in the formula for the geometrical population of the inner Tree of Life. As was revealed in #41, it is the number of yods below Binah of the 1-tree when its 19 triangles are 1st-order triangles. The number of yods in Pn outside the shared root edge = ½(105 + 47×3n+1) − 4 = ½(97 + 47×3n+1). The number of Haniel, the Archangel of Netzach, is 97. In the case of the seven enfolded polygons, for n = 1, 41 + 47 = 88; for n = 2, 88 + 141 = 229; for n = 3, 229 + 423 = 652; for n = 4, 652 + 1269 = 1921. 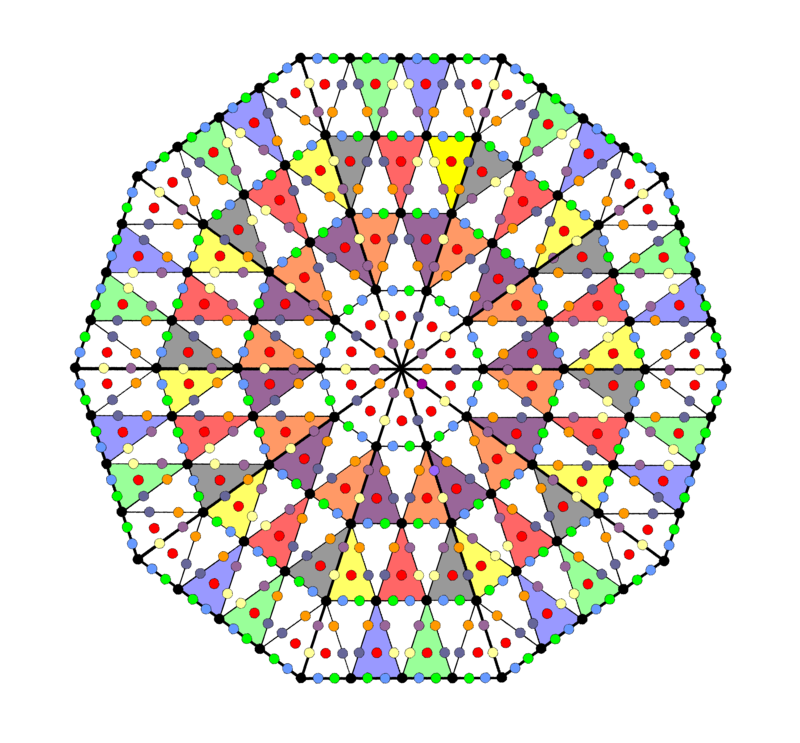 In the case of the (7+7) enfolded polygons, for n = 1, 80 + 94 = 175 − 1; for n = 2, 174 + 282 = 457 − 1; for n = 3, 456 + 846 = 1303 − 1; for n = 4, 1302 + 2538 = 3841 − 1. Notice that the numbers of geometrical elements for the seven enfolded polygons (green cells) is always twice the number of sides (blue cells). 264/176 = 687/458 = 1956/1304 = 5763/3842 = 3/2. 264 = 3×88, 687 = 3×229, 1956 = 3×652, 5763 = 3×1921. 176 = 2×88, 458 = 2×229, 1304 = 2×652, 3842 = 2×1921. The tone ratios of the octave, perfect 5th & perfect 4th appear in the proportions of various populations of yods and geometrical elements in the two separate halves of the inner Tree of Life (the case of 1st-order polygons is chosen as an example). 2Y = 3G + 1. G = 4Sn − 3. Y/G = 3/2 + ½(2S−1)−1. As n→∞, S→∞ and Y/G→3/2. The ratio of the yod & geometrical populations of the complete inner form of the Tree of Life is larger than the fraction 3/2 but reduces as n→∞ from its maximum value of 524/349 when n = 1 to 3/2 as its asymptotic limit for an infinitely populated inner Tree of Life. This amounts only to a decrease of about 0.095%. Even when n = 1, the ratio is only about 0.1% above 3/2. But, for the seven enfolded polygons, the ratio remains exactly 3/2 for all values of n.
S = C + T + 1. S′ = C + T.
G = S + S′. 349 = 175 + 174. 913 = 457 + 456. 2605 = 1303 + 1302. 7681 = 3841 + 3840. "Intrinsic yods" are discussed in many pages of this website. They are defined as all the yods in the inner form of the Tree of Life except the topmost corners of the two hexagons, which are shared with the lowest corners of the two hexagons belonging to the inner form of the next higher, overlapping Tree of Life. Intrinsic yods are those unshared yods that solely make up the inner form of each successive Tree. "Intrinsic geometrical elements" are, similarly, discussed many times. They are all those elements, apart from the topmost, shared corners of the pair of hexagons, that uniquely shape the inner form of each overlapping Tree because they are unshared with polygons enfolded in the next higher Tree of Life. Two other sets of yods and geometrical elements may be defined: 1. the yods or geometrical elements outside the root edge that create the form of the inner Tree of Life, and 2. the intrinsic yods or geometrical elements outside the root edge. Table 11 lists the relations between the populations of these types of yods and geometrical elements in the seven enfolded polygons and the (7+7) enfolded polygons (n.b. the subscript n is dropped from symbols because the relation: 2Yn = 3Gn holds whatever the value of n, although both populations are, of course, functions of n. But, for the purpose of Table 11, the change of symbols: Yn→y & Gn→g will be made, with Y & G still referring to the (7+7) enfolded polygons). G = 2g − 3. Notice in Table 11 that the relations between types of populations contain only the Pythagorean integers 1, 2, 3 & 4 expressed by the four rows of the tetractys. In particular, these integers are the constant that appears in the relations for the complete inner form of the Tree of Life. Their presence is indicating that these four classes of yods and geometrical elements are special. Much of the analysis in the pages of this website is devoted to them because they generate numbers and patterns that manifest in the group mathematics of E8×E8 and in the remote-viewing accounts of superstrings given over a century ago by Annie Besant & C.W. Leadbeater (see Occult Chemistry), as well as in the seven musical diatonic scales and in the correspondences between the inner form of the Tree of Life and other sacred geometries, as described in Correspondences and Wonders of correspondences. Bn = Cn + Gn = ½(105 + 329×3n−1). In particular, the number of boundary yods shaping the seven enfolded, 4th-order polygons outside their root edge = 4494 − 4 = 4490 = 449×10, where 449 is the 87th prime number and 87 is the number value of Levanah, the Mundane Chakra of Yesod. 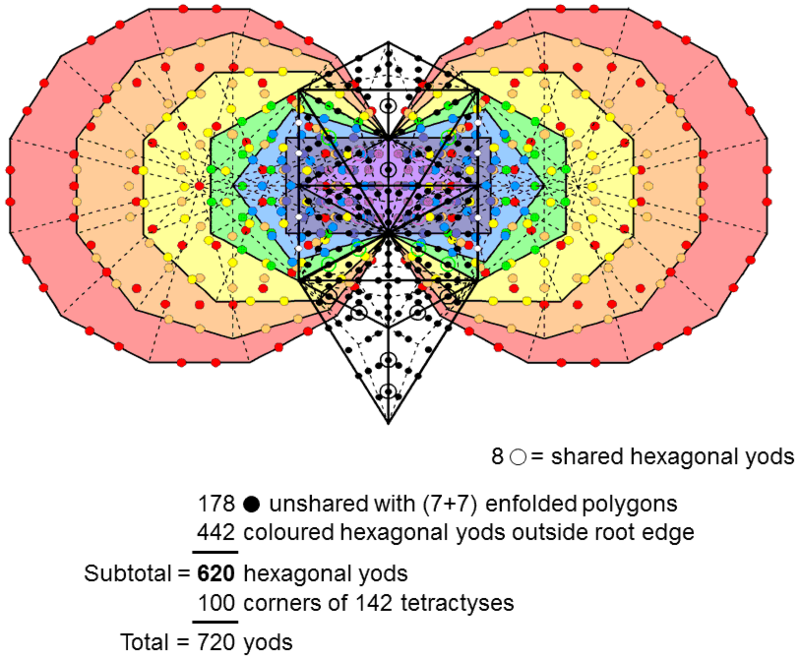 As the top corners of both hexagons in the (7+7) polygons enfolded in a given Tree of Life coincide with the lowest corners of the hexagons enfolded in the next higher, overlapping Tree of Life, there are (430−2=428) yods lining the (7+7) enfolded 1st-order polygons that are intrinsic to them. This is the number value of Chasmalim, the Order of Angels assigned to Chesed. Table 12 indicates that 217 yods line the seven enfolded polygons. (217−1=216) intrinsic yods line the 88 sides of the 47 tetractyses making up each set of enfolded 1st-order polygons with 36 corners, where 216 is the number value of Geburah and 36 is the number value of ELOHA, its Godname. When the outer form of the Tree of Life combines with its inner form, the number of geometrical elements or yods in the combination is not the sum of the respective numbers of both forms. This is because certain elements and yods coincide when they combine. They are indicated in the diagram below as blue yods and lines. Remembering that the plane occupied by the (7+7) enfolded polygons is that formed by the outer Pillars of the Tree of Life, each nth-order hexagon has six yods (two of which are corners) and two vertical sides of sectors that are shared with the Pillars of Judgement and Mercy and the horizontal Path joining Chesed and Geburah. Each enfolded nth-order triangle that occupies one of the sectors of each hexagon has one corner and one centre that coincide with yods in the outer Tree. It means that 16 yods (including six corners of triangles) and four sides are shared by the outer and inner forms of the Tree of Life, so that the combination needs 16 yods and 10 geometrical elements (six corners & four sides) to be subtracted from the sums of the respective, separate populations. For mathematical consistency, when the inner form of the Tree of Life is regarded as composed of 14 nth-order polygons, the triangles making up its outer form must be regarded only as nth-order. 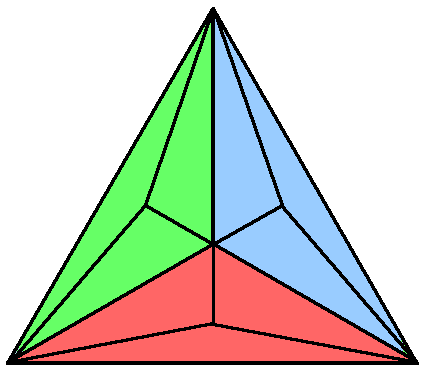 It would be inconsistent to combine 1st-order polygons with 0th-order triangles in the outer Tree as shown in the diagram, which is intended merely to display what yods and what geometrical elements become shared during the combination of the outer and inner forms — whatever the common order of their polygons and triangles. This consistency must be maintained when the outer and inner forms of N overlapping Trees or the N-tree are considered. What also must be considered is the fact that the two blue hexagonal yods on the Chesed-Geburah Path remain hexagonal yods, whatever the order of the triangles in the outer Tree of Life, whereas the blue yod (with which they coincide) at the centre of each triangle in the (7+7) polygons remains a corner of a 0th-order triangle, whatever the order of these polygons. It means that there are two unique yods in the combined outer & inner forms of the Tree of Life (and for every overlapping Tree) that are hexagonal yods with respect to its outer form but which are corners with respect to its inner form. Their dual status must be taken into account in calculating the hexagonal yod population of the combined Trees. Finally, the topmost corners of the two hexagons enfolded in a given Tree of Life coincide with the lowest corners of the two hexagons enfolded in the next higher Tree. This means that the number of yods shared by the outer and inner forms of N overlapping Trees of Life is 14N + 2, where "2" denotes the topmost corners of the two hexagons enfolded in the Nth Tree. It also means that the number of geometrical elements shared by both forms is 8N + 2. Both these quantities need to be subtracted from the sum of the separate populations of yods and geometrical elements to avoid double-counting when the two forms are combined. Table 13. Numbers of corners, geometrical elements & yods in combined forms of N Trees/N-tree. Notice that ADONAI, the Godname of Malkuth with number value 65, prescribes the yod population of the combined outer & inner forms of N Trees of Life, as well as their number of corners and geometrical elements, the number 130 being the 65th even integer. Here is remarkable evidence that the ancient Hebrew Divine Names determine through their gematria number values the very mathematical nature of the cosmic blueprint called the "Tree of Life." The increase in yods from N Trees to (N+1) Trees = 81 + 65×3n+1. For n = 1, the increase is 666. This is the 36th triangular number, showing how ELOHA, the Godname of Geburah with number value 36, measures how many yods are needed to build the outer and inner forms of successive Trees of Life. The average number of hexagonal yods that surround the axes of the five Platonic solids in their faces and interiors is 666 (see bottom of page here). The combined outer & inner forms of the Tree of Life with 1st-order triangles and polygons comprise 483 geometrical elements. Of these, three make up the root edge, so that 480 elements are outside it. This number is a characteristic parameter of holistic systems, e.g., the 480 hexagonal yods in the (7+7) separate polygons of the inner Tree of Life (see #21) and the 480 hexagonal yods in the faces of the first four Platonic solids constructed from tetractyses (see here). In the case of the E8×E8 heterotic superstring, it is the number of roots of E8×E8 (see under heading "Superstring gauge symmetry group" here). As the 1-tree shares 10 geometrical elements with its inner form (namely, the three corners and two sides lining the Pillars of Mercy & Judgement), the combined forms comprise 510 geometrical elements, of which 500 (=50×10) are unshared by either form. This shows how ELOHIM, the Godname of Binah with number value 50, prescribes the combined, outer & inner forms of the 1-tree. The 720 yods in the combined Trees of Life other than the two hexagonal yods in the root edge comprise 100 corners and 620 hexagonal yods. The 720 yods surrounding the centre of a decagon with 2nd-order tetractyses as sectors comprise 100 corners of 1st-order tetractyses and 620 hexagonal yods. the 720 edges of the 600-cell (see below Table 1a here). 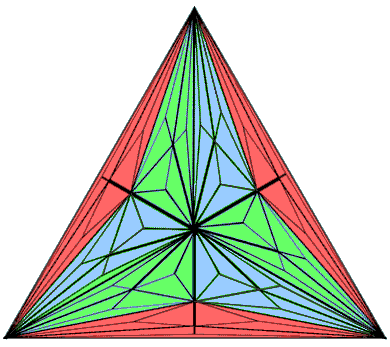 and the number of triangles in an nth-order N-gon ≡ tnN = 3n−1N. cnN + snN + tnN = 2snN. ** Proof: consider a set P of m different, separate nth-order polygons with N corners. According to Table 8, the number of yods in an nth-order r-gon = ynr = (3/2)(3n+1)r + 1. Number of geometrical elements = gnr = (3n+1)r + 1. Number of yods in P ≡ Y = ∑ynr = (3/2)(3n+1)N + m.
Number of geometrical elements in P ≡ G = ∑gnr = (3n+1)N + m.
The ratio (Y−m)/(G−m) of the numbers of yods and geometrical elements surrounding the centres of the m separate nth-order polygons is always 3/2. Suppose that p yods and q geometrical elements outside the sides that merge into the root edge vanish when the m polygons become enfolded. These are not the total numbers that vanish because the 4(m−1) yods and 3(m−1) geometrical elements making up the (m−1) sides that merge into the root edge of the enfolded polygons disappear as well. Number of yods in m enfolded nth-order polygons ≡ Yn(m) = Y − p − 4(m−1) = (3/2)(3n+1)N + 4 − 3m − p.
Number of geometrical elements in m enfolded polygons ≡ Gn(m) = G − q − 3(m−1) = (3n+1)N + 3 − 2m − q.
just pair 2. Then p = 1 = q, which satisfies the relation. pairs 1 & 2. Then p = 7 and q = 5, which obeys the relation. N = 34 + 2m. As m≥2, N≥38. P cannot be just pair 2, because they have only 15 corners. Nor can it be just pair 1 & pair 2, because they have only 24 corners. This means that m>2 and N>38. As the polygons must include the pentagon and the decagon, the remaining (m−2) separate polygons must have more than (38−15=23) corners. If they include both pairs of polygons, m>4 and N>(34+8=42), so that the remaining (m−4) separate polygons must have more than (42−24=18) corners. N = 39 + m + A. > 6 (P includes pairs 1 & 2). This means that either N>42, so that the remaining (m−2) polygons must have more than (42−15=27) corners, or N>45, so that the remaining (m−4) polygons must have more than (45−24=21) corners. If we insist that the 2m enfolded polygons have 70 corners and that their sectors have 80 corners, then P must include the pentagon and the decagon and the remaining (m−2) polygons must have more than 27 corners, or else it must include the triangle, pentagon, hexagon & decagon and the remaining (m−4) polygons must have more than 21 corners. In the case of the inner Tree of Life, the three remaining polygons (square, octagon & dodecagon) have 24 corners and so, as expected, the seven enfolded polygons display the property: Yn(m)/Gn(m) = 3/2. m − A = 5. As A = 1 or 2, m = 6 or 7 and m + A = 7 or 9. This means that N = 46 or 48. The latter possibility is displayed by the seven polygons making up the inner Tree of Life.